It’s been a while since my last wine and fabric pairing post, and there’s a good reason for it: I’m expecting baby #3 and therefore haven’t been drinking any wine! Now that the cat’s out of the bag, you will understand my relative blogging silence the past few months. The first trimester is exhausting, meaning my late night quilting was replaced by sleeping! This past week, though, my parents came to visit, and when I saw one of the bottles of wine my dad brought along, I immediately was inspired to make a quilt. 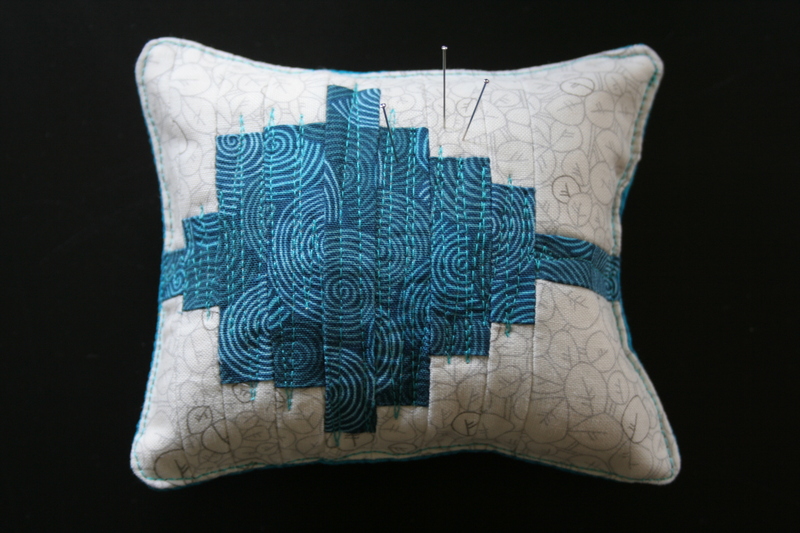 Or, in this case, a small pincushion for starters. 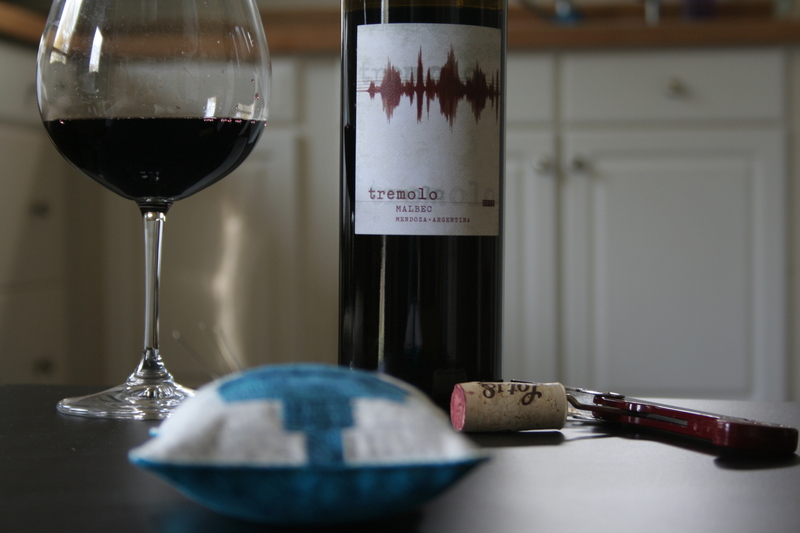 My first thought when I saw the 2013 Tremolo Malbec from Mendoza, Argentina (other than “Man, I wish I could have some wine”) was how the sound waves would make a cool quilt. 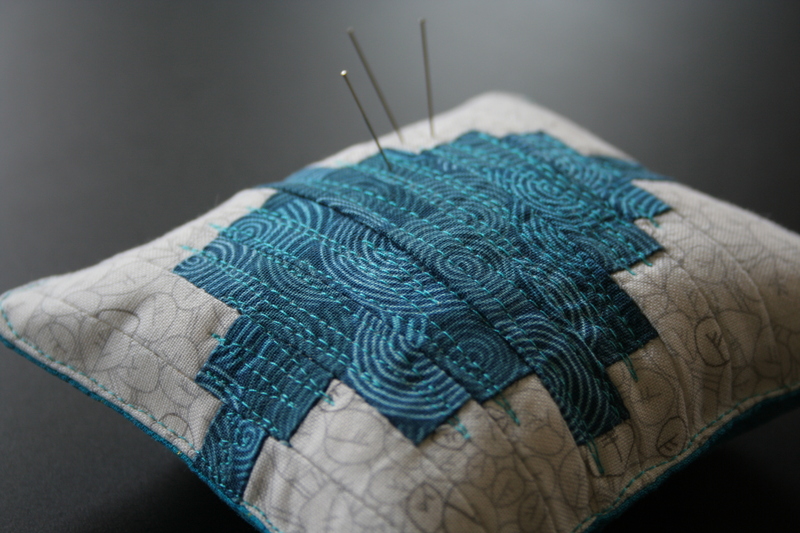 I did a bit of googling to see if I could find any existing sound wave quilts, and then decided to make my own practice version in the form of a pincushion. At first I was going to make it longer with gradating colors from dark to light, but due to time and resulting size I limited myself to just one sound wave. I used almost entirely scraps, but needed to cut one more 3/4″ strip of Carolyn Friedlander’s beloved botanics fabric for background. I’m mostly happy with how this turned out, but I feel like the strips should could be skinnier. Perhaps on a larger scale (think: pillow or quilt), the strips could be wider and still have the right sound wave generating effect. As it was, 3/4″ strips (finishing at 1/4″) were pretty tiny, and still look too wide for my taste. 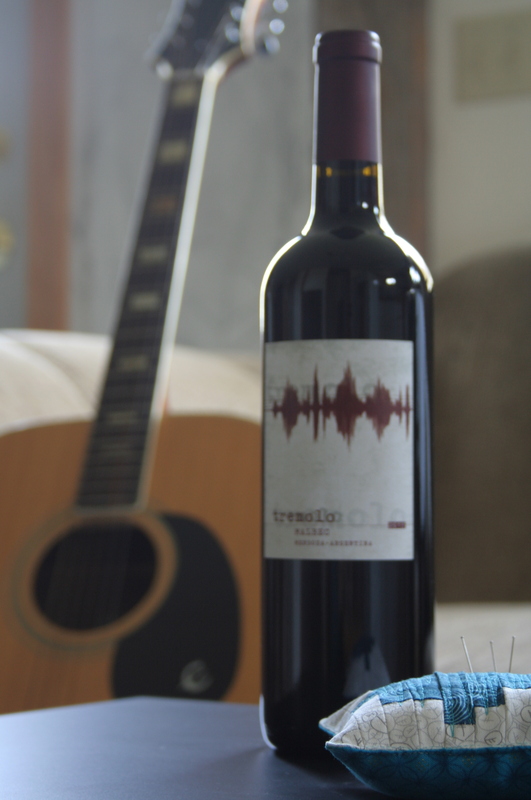 My dad reported that the Tremolo wine is very good, and nice and smooth. The label description says: French-born winemaker Didier DeBono crafted this 100% Malbec from grapes grown on two special, high-elevation vineyard sites in Mendoza. A Tremolo is an aurally pleasing musical effect we were reminded of upon tasting this harmonious, balanced wine. It sounds like my dad agrees, and that the inspiration can be extended visually, to music-inspired quilting! There you have it: another perfect wine and fabric pairing. 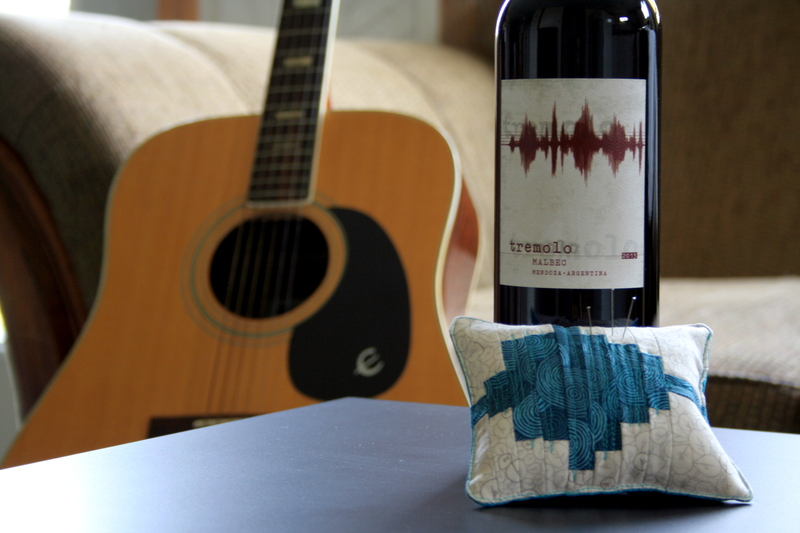 Drink Tremolo while you work on your musically-inspired quilt, whether it be a tiny pincushion or a king sized quilt! Tasting notes from website: Rustic, earthy and even a bit restrained at first, after some air this wine will reveal excellent fruit concentration with notes of dark cherry and blackberry, plus a hint of vanilla and a meaty, earthy finish. It finishes dry and will leave you thirsting for more – especially if you’re having it with grilled meat. Or if you’re in the middle of an aurally and visually pleasing quilting project. A perfect pair, indeed. This beauty was found on the November 1, 2009 tumblr post on http://allfortheloveofgooddesign.tumblr.com/. It’s a photo taken at the African American Quilts exhibit at the Nelson Gallery, of a quilt called Piano Keys by Avis Collins Robinson. I absolutely love this quilt by Heather Preggers. Visit her blog to read more about her thought process and creation of this quilt. She also has many other variations of this tuning forks quilt, since she’s admitted she is somewhat obsessed with them! They are all gorgeous and resonate with sound and movement. 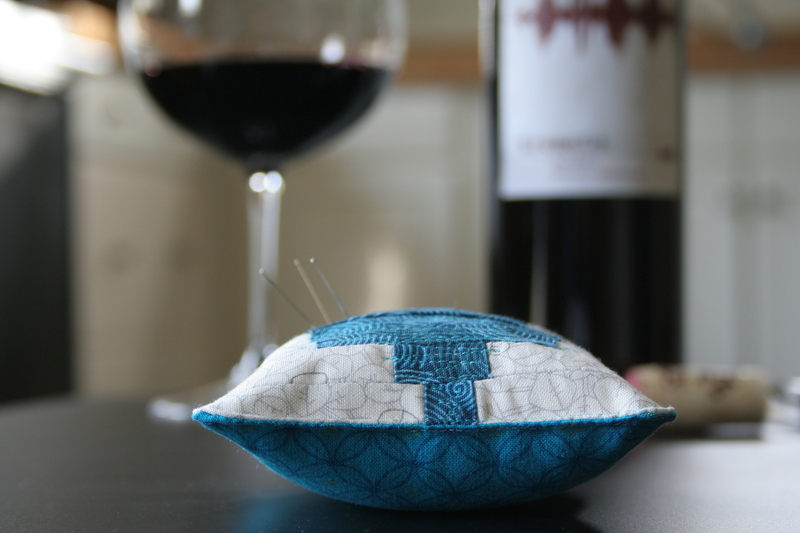 I’m linking up with Crazy Mom Quilts Finish it up Friday, since I finished my pincushion and paired a nice wine! Love Carolyn Friedlander’s fabrics. Definitely pinning your pincushion 🙂 The blue against the low volume is breathtakingly beautiful. WOO! That is so exciting! Congrats! Have you found any fun baby quilts you want to do? I love your pin cushion too btw! Nice pin cushion and congrats on the baby. What a great theme! Thanks for including my quilt. And congratulations on baby #3! What a fantastic experiment! I love the pin cushion. And congrats on baby #3! Hope you are feeling more energetic this next trimester and that the rest of your pregnancy is a breeze.